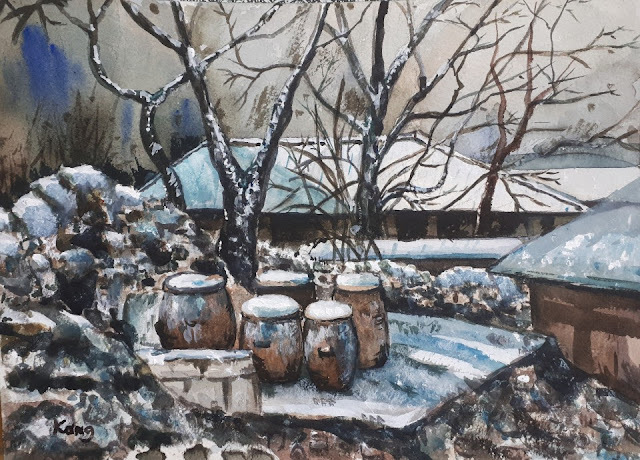 She also texted info indicating that some of her paintings will be featured as part of an art exhibition taking place in a Jongno-area gallery from Wednesday, November 7 to Tuesday, November 13. (If you're interested in seeing the exhibition, I can forward you the information that Ajumma forwarded to me.) I'll be heading out there soon to see her work. It's interesting to ponder the commonalities between the Eastern and Western halves of my family. My great aunt Gertrude was an accomplished singer and theater actress back in the day; her brother, my great uncle Trav, was a regionally known painter. My #3 Ajumma is artistically talented, along with being a singer in her church's choir; her eldest son (now a dad) is a professional singer who often performs at the regional and national level while also giving private lessons. My brothers are both musically talented—David with the violin, Sean with the voila and cello—although David has dropped music in favor of video production which, I think, still requires a musical sensibility to do well. Sean is a professional cellist and self-taught pianist, performing all over the world and giving his own private cello lessons in the northern Virginia area. As for me, well... I do a bit of drawing and, occasionally, some brush calligraphy; I've also still got the acting bug (I did French-language theater in college), but the thing I do most often is write, and language is the business I'm in. The creative Force runs strong in my family, I think. Talented family for sure. And you are a published author yourself! The painting is gorgeous! I think that there is a general strain of creativity that uses what ever it finds in it host. In my case, I played French horn and sang. Then when I couldn't play horn I sang. Then I was able to play horn for a while. Then I did some drama. Then I sang again. Now, I can no longer play or sing, so I write. I am fortunate to have that many avenues to explore. (and for a while I sculpted) But anyone with creativity will find an outlet. It is something that cannot be suppressed.